After Bee Gees 1st, the Bee Gees went straight into their next album. Horizontal has a much bigger sound than 1st and, with more use of electric guitars, it has a much harder edge. There is also less reliance on strong melodies and more on abstract lyrics. This is perhaps best illustrated by the hit single 'World', which mixes swooping guitars with haunting organs and lyrics that make the listener think just a little. 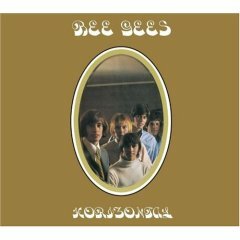 Songs such as 'Lemons Never Forget', 'Harry Braff' and 'The Earnest of Being George' are good examples of 1960s rock, but are more forgettable than much of the Bee Gees later work. The album has two haunting Robin solo works, 'And the Sun Will Shine' (an album track which would remain on the Bee Gees' tour itinerary until the 1990s!) and 'Really and Sincerely' (reportedly written after the Hither Green train crash of earlier in the year, in which Robin was involved). And, of course, the album features the first ever Bee Gees number one single, the anti-flower-power tour de force 'Massachusetts'. It is worth buying for this alone. Overall, this album is less enjoyable then the previous album, and in some ways less polished, but it is certainly never boring. It showcases the group moving forward and experimenting with new ideas, with ultimately mixed results. The 'Expanded and Remastered' version, released January 2007, includes a bonus CD with previously unreleased tracks and demos. Buy it for the main hit singles and for the fun of trying to work out the meaning of several of the songs! Now also available as part of the box set The Studio Albums 1967-1968.